Last month while staying in China I was able to combine business with pleasure and got the opportunity to visit Forbidden City in Beijing. It took me almost 4 hours to complete the walk from the beginning to the end of the Forbidden City palace. I was lucky the weather condition were perfect to enjoy the sight and taking a nice walk to photograph. I borrowed from my co-worker Micha Sulman his 70-300mm lens and started to take some nice pictures. I captured faces of strangers and I had of fun doing that. The result a amazing set of 15 pictures which I am sharing. The third picture with the young soldiers I took at the end with my own 18-135mm lens. The Forbidden City is the world’s largest surviving palace complex and covers 72 ha (178 acres). It is a rectangle 961 metres (3,153 ft) from north to south and 753 metres (2,470 ft) from east to west. It consists of 980 surviving buildings with 8,707 bays of rooms. 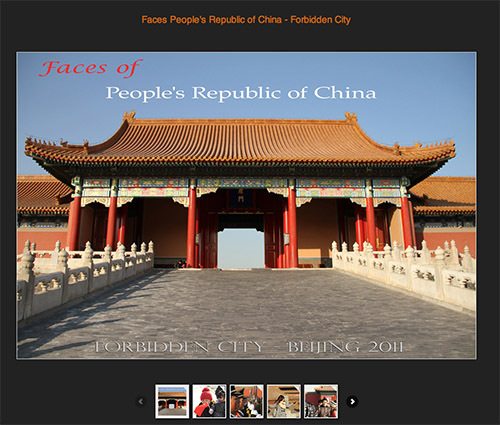 The Forbidden City was designed to be the centre of the ancient, walled city of Beijing. It is enclosed in a larger, walled area called the Imperial City. The Imperial City is, in turn, enclosed by the Inner City; to its south lies the Outer City.The Forbidden City remains important in the civic scheme of Beijing. The central north-south axis remains the central axis of Beijing. This axis extends to the south through Tiananmen gate to Tiananmen Square, the ceremonial centre of the People’s Republic of China. To the north, it extends through the Bell and Drum Towers to Yongdingmen. This axis is not exactly aligned north-south, but is tilted by slightly more than two degrees. Researchers now believe that the axis was designed in the Yuan Dynasty to be aligned with Xanadu, the other capital of their empire.